Success stories usually start with bold visions. This was also the case for MAM and our founder. Let's take a quick look at the situation a few decades ago: in the mid-seventies, parents had to make a decision when buying baby products: they could have either an attractive design or medically proven functionality. A nice-looking product. Or a good product. Baby products that were both good and attractive simply didn't exist. The trained plastics engineer and devoted family man Peter Röhrig decided to change this. Together with scientists, doctors and designers from Vienna University of Applied Art, he developed a soother that set new standards both in terms of design and function. And so MAM was born, along with the unique teamwork that is still behind all MAM products. 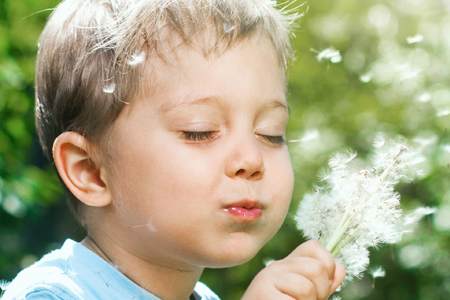 "Is there anything more sustainable than working for the next generation – our children? We work for the well-being, safety and health of babies all over the world." Click here for the website of the MAM sustainability report. The complete MAM sustainability report to browse or download. 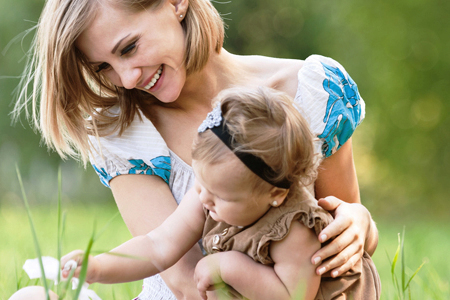 As a family company that is committed to the well-being of babies, MAM has always been sustainable. We work for babies! So we put as much care and attention into every detail, action and decision as if it were for the most important baby in the world. "At MAM, we want to use our skills to make the world a better place, in a way that is both sustainable and visionary. After all, today's babies are tomorrow's adults." 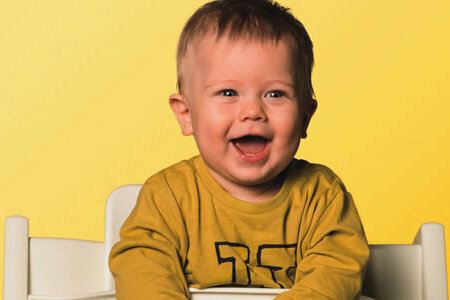 MAM produces and sells baby products that are the result of unique, worldwide teamwork. Medical and developmental psychology experts, midwives and parental advisors work with material and production technology specialists and respected designers. MAM also regularly involves parents in the development of products. MAM does not produce just any baby products. We only make products that we and our expert network truly understand. 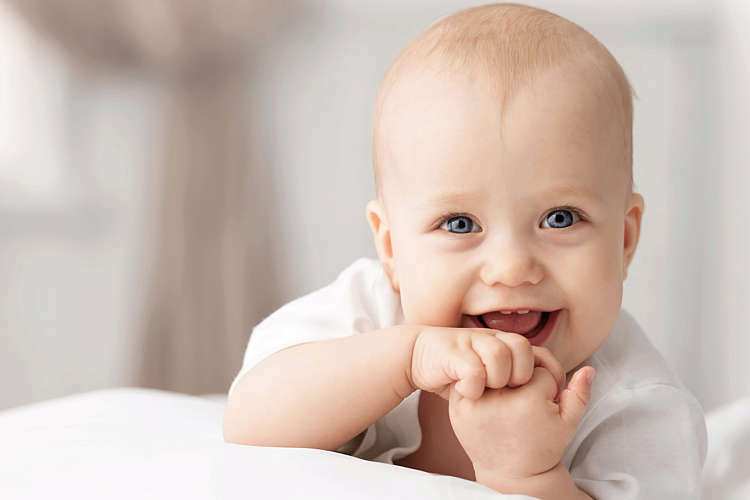 We have a portfolio for babies aged between 0 and 3, focusing on soothing, breastfeeding and feeding, oral and dental health and the mental and physical development of children. MAM undertakes and promotes research on babies' health. This allows us to improve our expertise, products and in turn satisfaction of parents and babies. But not only that – we also share the results of our studies, whether in the section of our website for healthcare professionals or as a member of official control and standardisation bodies. MAM guarantees quality by carefully selecting, regularly assessing and properly supporting suppliers. However, we do the most important work ourselves. For example, our research and development activities are based in technologically skilled locations such as Austria, our production activities in Hungary and our rubber manufacturing activities in Thailand – all in accordance with strict European quality criteria. We at MAM are aware of our responsibility. support a society that cares about the well-being of babies by means of appropriate products and knowledge and from an ecological and social perspective. We have derived various fields of action from our motto and principles. Ultimately, we would like to make the world a better place for babies and parents, but also for our employees, the environment and society. Strong relationships with our stakeholders are important in all areas – from product development to production, distribution and sales. We cultivate existing contacts and always look for new ones in order to ensure that we maintain an active collaboration with parents, doctors, suppliers and similar. All interests brought to our attention and their contributors are discussed and classified according to impact and urgency in an annual CSR team workshop, with the involvement of various departments. Stakeholder interests are thus included in strategic planning and communication is focused on crucial topics for our stakeholders. How can we guarantee all this? We only use food-safe raw materials for products that come into contact with saliva or that are placed in the mouth (such as soother clips and teething rings), even though there are no statutory specifications for this. Our first production site was established in Hungary in 1990. 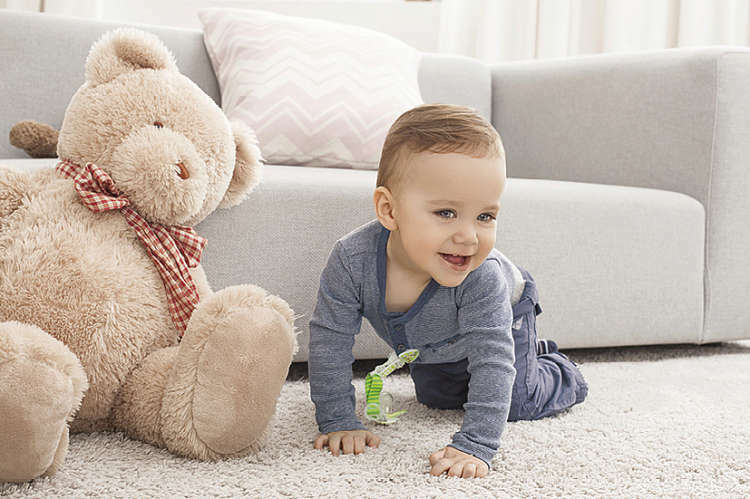 As we place great value on safety and quality, the majority (85%) of the plastic parts used in our baby products are from Austria. In this context we have been working with regional suppliers for many years. The parts are put together, packaged and dispatched worldwide from our production site in Vaskeresztes. Instead of polycarbonate (PC), which contains BPA, polypropylene (PP) is used for baby bottles and other MAM products. PP is a semi-crystalline thermoplastic and belongs to the group of polyolefins. Its chemical structure is similar to that of candle wax. PP is resistant to almost all organic solvents, fats, acids and bases, is also odourless and does not irritate the skin and is therefore very well suited for use in the food sector and pharmaceuticals. Today, PP is the second most important plastic in the world (by sales), is undisputed internationally and has had all required approvals for years. Silicones, more accurately known as poly(organo)siloxanes, is a term for a group of synthetic polymers in which silicone atoms are linked by oxygen atoms. Their structure is similar to organically modified quartz. At MAM, food-safe silicone is used to produce teats. The material is also tried and tested in other areas of medicine, such as in dentistry in the production of precision models or in orthopaedic technology to create both internal and external prostheses. As an alternative to silicone teats, MAM also offers soothers made from soft but very firm (though not as clear) natural rubber. Why don't we use eco-plastic? Recycling and biogenic plastic are current issues for all people concerned with sustainability. We therefore understand why we are often asked about the use of recycled or biogenic plastics in our production processes. We have clear answers to these questions. Biogenic plastics (made from natural raw materials) currently do not offer the required heat resistance or the high level of breaking strength demanded by MAM quality guidelines on hygiene and safety. With regard to recycling plastics, the purity of available recycled materials cannot be guaranteed to a sufficient extent. Essentially, until it can be precisely documented which different materials, containing which components and in which degree of cleanliness, are used at recycling plants, we cannot be sure that the end recycled material is not harmful to health. 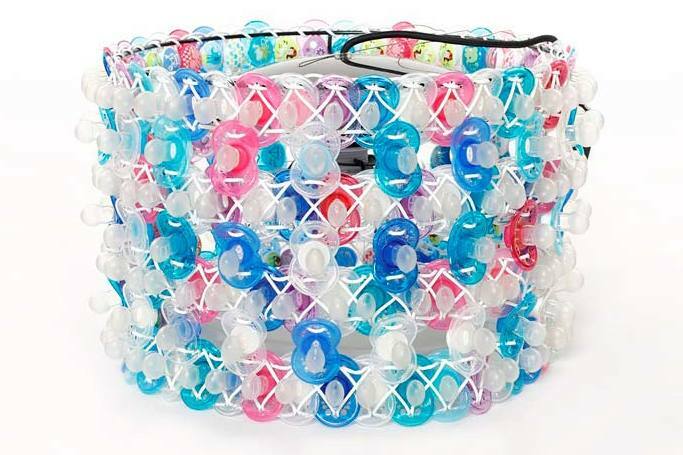 We do not want to use such materials to make products for babies. MAM products fulfil all relevant, globally applicable norms and standards. However, in order to be absolutely certain of this, internal specifications and controls have been developed in the company that go far beyond official requirements. Safe baby products must satisfy a range of requirements and, in our view, there is no room for compromise here. 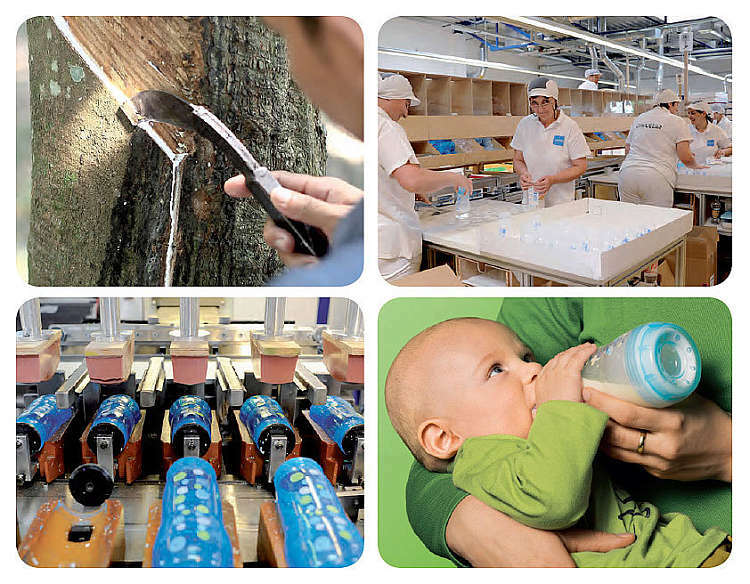 All plastics used in MAM baby products that come into contact with food or saliva are approved for food contact applications in accordance with Regulation (EC) 1935/2004 and are guaranteed by the raw material suppliers to have been produced in consideration of the requirements of good manufacturing practice as prescribed in Regulation (EC) 2023/2006. MAM founder Peter Röhrig is not alone in being a trained plastics engineer. We also rely on a number of other trained plastics experts for our research and development and production activities. We also encourage international exchange in this specialist community, so that we can learn about new findings relating to material properties and plastics innovations early on and share our own findings. We also share the knowledge that we gain with legislators and standards authorities. For example, MAM founder Peter Röhrig and Hortenzia Csiszar, responsible for product safety and compliance at MAM, continuously contribute to the preparation of safety standards for products for small children in CEN Working Group 5, 'Feeding, Drinking, Sucking' (European standard). The E-standard EN 14350 Drinking Equipment (baby bottles and teats, cups etc.) came into being largely due to MAM knowledge. The E-Norm EN 1400 Soothers was recently revised. All standards institutions in the EU and other affiliated countries such as Switzerland and Norway agreed to and accepted the draft, which MAM contributed to, with 98% approval. Our second production site is located in Thailand, where around 100 employees make our latex teats. Fresh milk from the hevea tree is harvested by sustainable farming families and small, local cooperatives and processed on site to produce the natural rubber required for this. We thus avoid long transport routes and the associated loss of quality, as well as unnecessary CO2 emissions. More information on our environmental measures can be found in the latest CSR report. A sound environment is important for our children's future. As a company, contribute to this by making our production conditions as responsible as possible. At MAM, we are mindful of our consumption of water and energy and are as careful and efficient as possible in our use of commodities and materials. The way in which we produce, package and transport our products is recorded in our CSR report, which is published every two years. Nonetheless, it is also important to us that responsible use of our products helps to ensure that negative effects on the environment are kept to a minimum. This will enable us to make a positive contribution to climate protection together with our consumers. What is a CO2 footprint? The emission of carbon dioxide (CO2) caused by humans is a significant contributor to climate change. By reducing our use of fossil energy sources, namely oil, gas and coal, we can reduce CO2. Whether it's fuel or electricity, it is important to save energy at all levels. The CO2 footprint of a product shows how successfully this is being done. It is an ecological measurement that shows how many greenhouse gases are emitted throughout the product life cycle. The smaller this is, the better. What are the consequences of too much CO2? The world's energy needs lead to huge amounts of CO2 being generated. The resulting high concentration of carbon dioxide is already so great that it has a significant effect on the climate. The resulting greenhouse effect has negative consequences for nature, the environment and society across the globe. It is therefore imperative that we all produce as little CO2 as possible. The scientific review and testing of MAM product performance by independent third parties in an integral part of our corporate strategy. 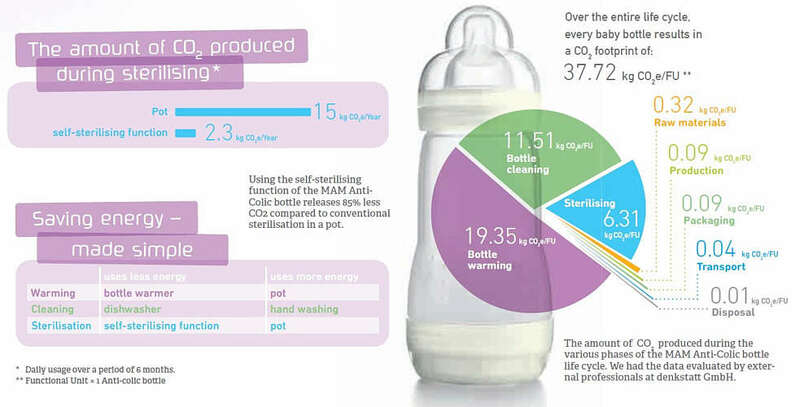 As part of our professional engagement with sustainability we had the CO2 footprint of the MAM Easy Start TM Anti-Colic bottle evaluated (carried out by denkstatt GmbH Vienna (www.denkstatt.at). 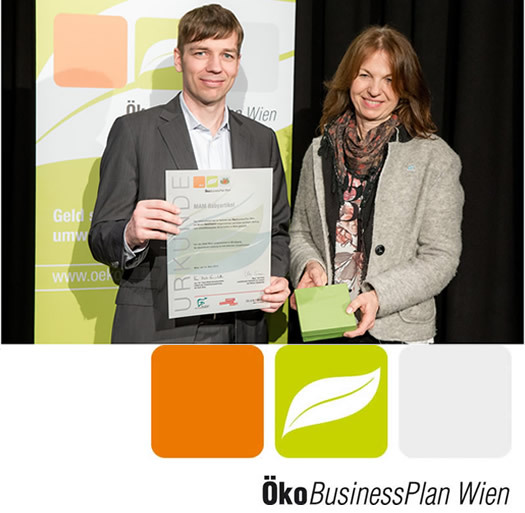 In 2015, MAM was recognised by EcoBusinessPlan Vienna for the second time in a row. The EcoProfit module enables our site in Vienna to implement improvement measures with regard to waste, energy, water, procurement and mobility, following an input/output analysis of all materials. In this way, we are dealing with the environmental effects of our business activities in a place where we are able to bring our expertise to bear; this is fully in line with our principle using our capabilities to make the world a better place in a way that is both sustainable and visionary. Because today's babies are tomorrow's adults. Procurement: change to environmentally certified paper, cleaning agents, dishwasher tablets and indoor blinds. Energy: change to 100% green electricity while reducing electricity costs and installing LED lights in staircases and the first floor. Mobility: fuel-saving training for all employees with a company car and CO2 compensation of all business trips undertaken by all MAM Vienna employees. The financial contribution is used to carry out a climate protection project in Austria. Upcycling at MAM: giving soothers a new lease of life! Children have a very emotional relationship with their soothers. They are a source of comfort and reassurance and are loved by babies and their parents. All the same, eventually the time comes when children part ways with their soothers. What should be done with this trusty companion? MAM Babyartikel, Austria's leading manufacturer of baby products and the market leader for soothers in many countries, asked this question in 2014. As part of the competition launched by MAM Babyartikel, 'MAM 2nd Life', some unique works were created. Students at the University of Applied Art were asked to create something new out of MAM soothers. The results are creative, exciting, practical and always unique. Just like the MAM soothers themselves – and the little ones they are made for. Further creative, practical ways to breathe new life into MAM products can be found in the 'Made by me' section of our website. Calculate your CO2 savings with MAM products. With the MAM Easy Start™ Anti-Colic -- the only baby bottle with a self-sterilizing function -- and with the handy sterilisier and carry case for our soothers. For more information about the carbon footprint of our MAM products and our corporate responsibility at MAM, see our CSR Report. All results are based on the carbon footprint calculations from denkstatt. Rely on a CO2-saving method and save energy. With the self-sterilising function of the MAM EasyStart ™ Anti-Colic Bottle and the MAM soothers with the practical sterilisation box. As a commercial enterprise it is our aim to work with a focus on profit. This is the only way we can safeguard jobs and continue to subsidise important areas such as research and development. However, we also see it as our social responsibility to make a contribution to society. In addition to our own research work, we therefore also support general research projects, medical studies, trade events, hospitals, parental counselling and numerous children's aid organisations. We are also in constant dialogue with our stakeholders so that we can continuously develop our products. At MAM, we don't do what we do for a 'target group'. We do it for people. For mothers, fathers and all other people in a modern family who care about their children. The experience of having a baby is something special – and that's not just an assumption, we know this for a fact! We know this because we speak to a lot of parents, listen to their needs and receive their feedback on our work. Between 2009 and 2014 alone, MAM shared its market research on requirements of and opinions on MAM products with more than 35,000 parents worldwide. Product tests, scientific studies, the MAM Club, MAM on social media and the MAM newsletter are further means of exchange with our consumers. Our expertise is reflected in 29 inventions, protected in 274 patents and 2 industrial designs, and in the protected appearance of 55 product designs in 252 registered designs. The Finnish sub-group of the 'Baby-Friendly Hospital Initiative' uses baby products from MAM. Expectant mothers in the United Arab Emirates receive support from MAM experts on dental hygiene for children from the very start. The South African advisory organisation for parents of premature children is supported by MAM. The MAM office in Chile is an established cooperation partner of the Chilean Midwifery Association. MAM Italy launched a workshop series on pharmacist education and training together with a pharmacist association. MAM supports a project to prevent early childhood caries (ECC) by promoting dental hygiene and care from the very start. To this end, we provide dental care products and informative material and have also taken care of sponsorship and financing since May 2012. A question frequently asked by parents of infants in medical settings concerns dealing with colics and colicky complaints. We therefore commissioned an Austrian study on the reduction of colics in babies. The aim was not to alleviate colics, but to reduce them from the outset. 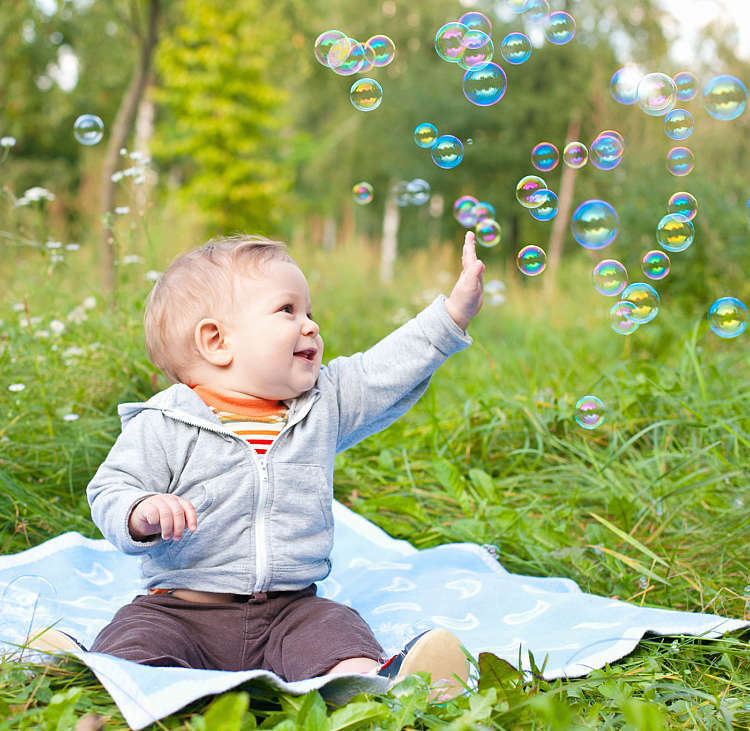 MAM regularly conducts studies on the connection between the shape of soothers and malocclusions. Our experts also share their valuable knowledge by means of their involvement in international standardisation and regulation processes. As such, they make a significant contribution to the continuous improvement of child safety regulations. In order to spread research and knowledge about the risk of SIDS, MAM works closely with expert organisations across the globe to explain recommended precautionary measures and consequently reduce the risks as far as possible. Our relationship with our worldwide branches and distribution partners is not based solely on the distribution of products. Rather, we see ourselves as a big family that shares knowledge and encourages exchange. As well as its plant in Hungary and latex production site in Thailand, MAM has numerous (for the most part long-term) suppliers for materials and logistics. The most important factor in the selection of suppliers is the product quality provided, followed by costs and reliability. We require the same technical, ecological and social standards of our suppliers as those that we have set ourselves and are guaranteed in our plants. We therefore have a close relationship with our suppliers that is built on mutual trust and proven reliability. Refugee aid played a significant role in 2015. Many of those seeking refuge came with their entire family, including many young children. We therefore donated more than 16,000 MAM products ranging from baby bottles to soothers to 30 different organisations. We launched an equipment donation campaign at our site in Vienna in August. Together, our employees donated two cars full of various relief supplies, including everything required for initial aid: nappies, wet wipes, soap, shampoo, toothpaste, sleeping bags, clothes, shoes, toys and much more. 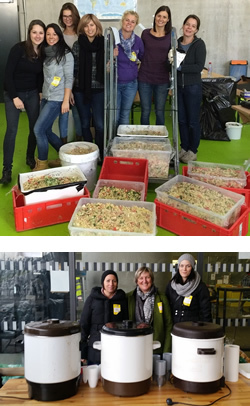 Midwife Sarah Klarer worked closely with the refugee centre in Traiskirchen where she handed out donations on site. MAM employees also supported the refugee initiative 'Train of hope' in 2015. The initiative was awarded the Austrian Human Rights Prize in 2015 and voluntarily coordinates emergency aid for refugees at Vienna Main Train Station. The aim is to provide passengers with food, materials and equipment and information. Over two days, many MAM employees joined the team, handing out materials and equipment, tea, water and coffee, and receiving relief supplies and cooked food. Expectant mothers, mothers and their partners have received support on pregnancy, childbirth, breastfeeding and the first few days with new babies since 1989. Experienced midwives, social workers and doctors provide women with advice in a time of their lives that often throws up many questions and uncertainties. MAM supports the Midwifery Centre financially and by donating products and providing information materials. The partnership with the Midwifery Centre is, however, much more than a one-sided contribution from MAM. We are happy to receive feedback and input on our products from the experts at the Midwifery Centre. Professionals work at MAM. However, beyond all skills and specialist knowledge it is the person performing the job who is especially important to us. We do not see ourselves as merely an employer, but also as a supporter of our employees, with the aim of creating the best possible working environment and thereby allowing the best possible work to be produced. is to provide children with the best possible support in their development and to help discerning parents to cater for their baby's everyday needs. This motto is also an apt description of working life at MAM. MAM's some 1000 employees engage in a continuous global exchange – from Austria to Thailand, from Sweden to South Africa – and continuously provide each other with international information from renowned design, scientific, medical and technical experts. How do we work at MAM? Throughout the entire worldwide MAM organisation, we see ourselves as a family company in the truest sense. Children and a career are naturally compatible at MAM and are not a critical issue, but actively encouraged. After all, as we say at MAM with a twinkle in our eye, the best ideas come about when people who have children collaborate with those who don't. We aim for equal opportunities and encourage personal and professional development and active dialogue between operational teams and management, all in a safe and healthy working environment. 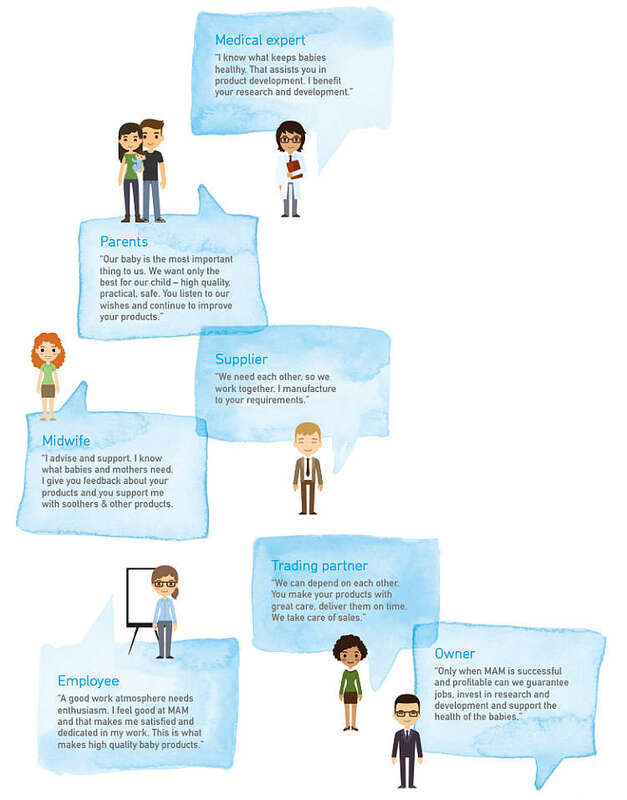 We are a young, multicultural, gender-balanced team at all levels, from our interns right up to the management. Openness and respect for other ways of thinking are always at the core of our collaboration. Our cooperation is based on values such as honesty, trust and reliability. Women make up more than 70% of our production and administrative staff and more than 30% of our management staff (worldwide). Employees with children: 62% of employees at MAM have children, and this figure rises to 83% for MAM's management team. As is the case for our product development, it's not enough for us to merely comply with existing laws and regulations when it comes to our staff. We therefore take special measures at our sites to address our employees' needs as well as we possibly can. regular, free mammographies, eye examinations, vaccinations. employees and their families receive additional insurance, extra holidays and contributions towards their children's education costs. More information on our social measures can be found here. As has unofficially been the case since the company was founded, the Federal Ministry of Economy, Work and Family has now also officially recognised MAM as a 'family-friendly company'. Our company received the 'Work&family 2014' certificate. The certification covers all measures taken by a company to make it easier to combine work and family. This does not end with parental leave and returning to work, but also includes elderly care and health care. An internal survey confirmed that, as an employer, MAM is extremely interested in its employees and in finding individual solutions to all problems. Following this success, our next aim is to further professionalise our management of parental leave. 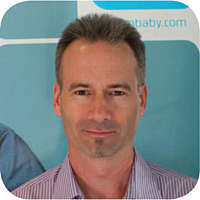 "I've had the pleasure of working at MAM as a product developer for almost 20 years which has enabled me to be part of an informal, global team, actively and passively shaping the future for many millions of babies and their families. I've also been able to contribute to the development of the company itself, and therefore every single member of the global MAM family." 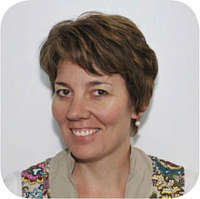 "As creative people, it's great fun for our designers and I to conjure up bright colours and designs for baby products. MAM is heaven for people who want to help to create a happier, more playful world for children." "It's great to work in such an informal environment. 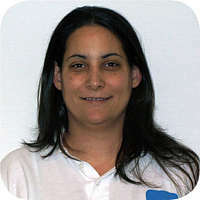 I'm very happy because, as a MAM employee, I know precisely why our products are so good. I'm familiar with the manufacturing process so I know that quality assurance is very important." Our Code of Conduct regulates interactions between employees and our business and customer relationships and therefore forms the basis for ethical and legally correct conduct at work. The Code is based on our corporate philosophy, regulations, laws and the 10 principles of the United Nations Global Compact.